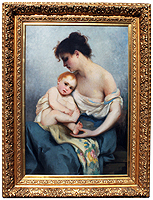 Attributed to Charles Edward Hallé (British, 1846-1914) "Mother and Child" Oil on Canvas, depicting a young mother holding her infant child, within a carved gildwood and gesso frame. (Relined). Signed (l/r): C.E. Hallé. Circa: 1870. Charles Edward Hallé (British, 1846-1914) Born in Paris, the son of Sir Charles Hallé. He painted portraits and historical scenes and studied at the Royal Academy of London under professors Richard Doyle and Baron Marochetti. During his travels throughout Europe, in France he worked with Victor Mottes, a student of Ingres. While in Italy, he began working on the tradition of Neo-Classicism. In 1866, When he got back to London, he exhibited his works at the Royal Academy of London. He then moved back to Venice, Italy where he studied the techniques of Venetian Masters. In 1877, together with Joseph Commyns, he worked with Lord Coutts Lindsay in the opening of The New Grovesnor Galley. In 1888 he and Burne-Jones opened the gallery on Regent's Street where he exhibited many of his works. 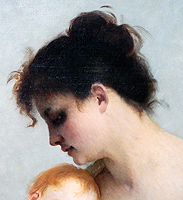 Hallé's works are part of the collection at the Sheffield Museum. 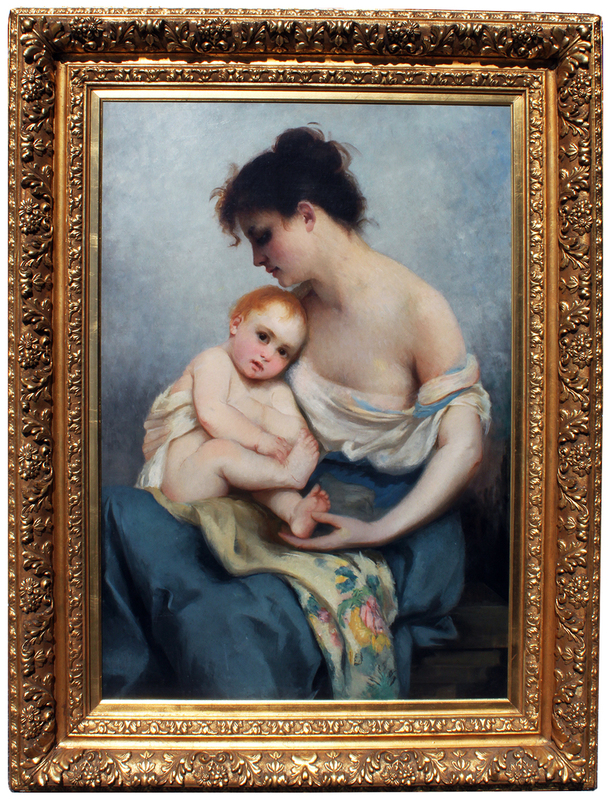 Attributed to Charles Edward Hallé (British, 1846-1914) "Mother and Child" Oil on Canvas, depicting a young mother holding her infant child, within a carved gildwood and gesso frame. (Relined). Signed (l/r): C.E. Hallé. Circa: 1870. Charles Edward Hallé (British, 1846-1914) Born in Paris, the son of Sir Charles Hallé. He painted portraits and historical scenes and studied at the Royal Academy of London under professors Richard Doyle and Baron Marochetti. 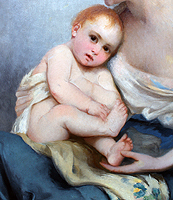 During his travels throughout Europe, in France he worked with Victor Mottes, a student of Ingres. While in Italy, he began working on the tradition of Neo-Classicism. In 1866, When he got back to London, he exhibited his works at the Royal Academy of London. He then moved back to Venice, Italy where he studied the techniques of Venetian Masters. In 1877, together with Joseph Commyns, he worked with Lord Coutts Lindsay in the opening of The New Grovesnor Galley. In 1888 he and Burne-Jones opened the gallery on Regent's Street where he exhibited many of his works. 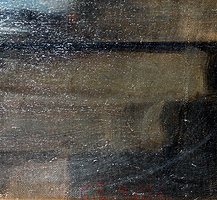 Hallé's works are part of the collection at the Sheffield Museum.